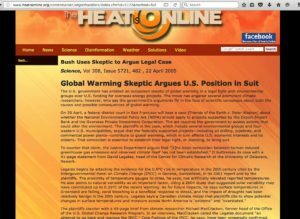 One more in the series of occasional guest posts written by skeptics of catastrophic man-caused global warming people who encountered character assassination efforts from critics rather than reasonable science-based debate. 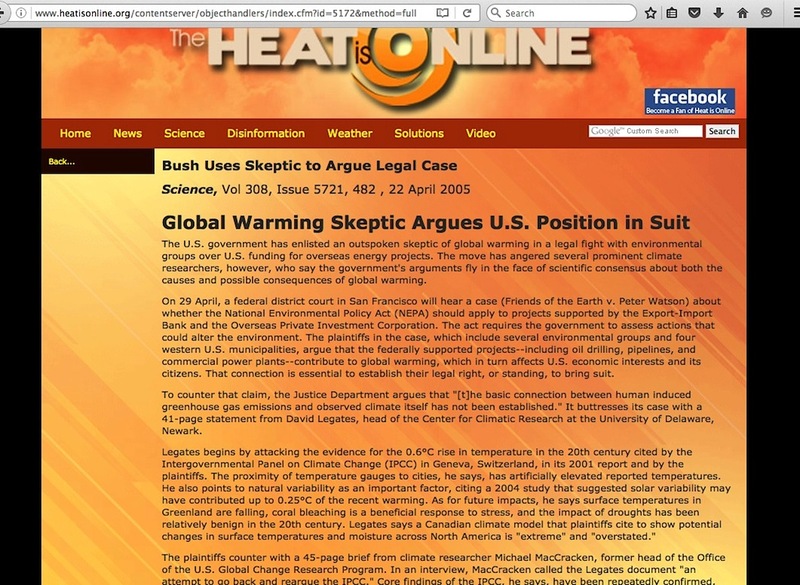 Today, a brief post by Dr David Legates, current Geography professor at the University of Delaware and its former Director of the Center for Climatic Research, who tells about a 2005 interview situation with a reporter at Science magazine who appeared to be pursuing anti-science answers for an unflattering article about Dr Legates. 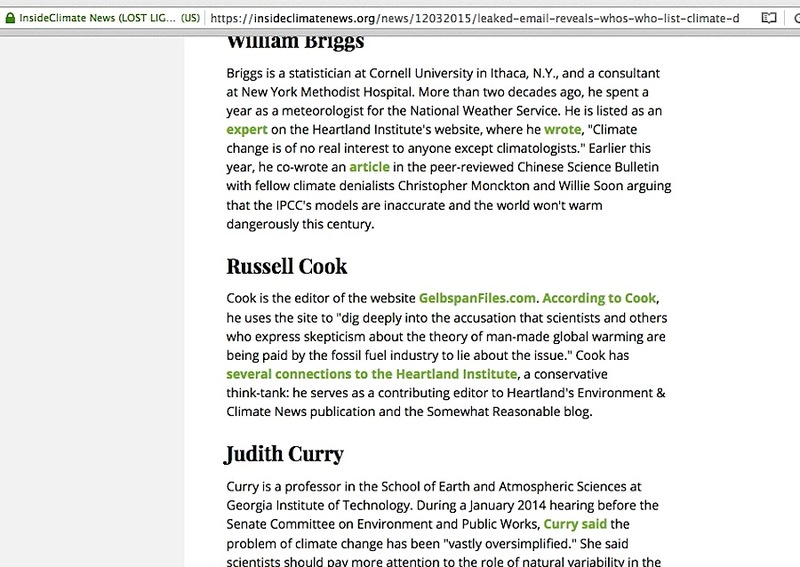 First, a setup of what prompted this guest post: To paraphrase what I said in a prior one of these, I’m an ordinary citizen blessed with an extraordinary email address list of scientists and speakers who question the idea of catastrophic man-caused global warming (corroborated in an entertaining way by Inside Climate News’ 2015 “Leaked Email Reveals Who’s Who List of Climate Denialists” article, which placed me between William Briggs and Judith Curry). So, no surprise that I was recently among email recipients of an alert from one of the guys asking if we were aware of a particular pro-global warming activist and material attached in the email relating to the activist. My reply to the group briefly detailed the activist’s entanglements with other activists, one of those being a person profiled by Science magazine reporter Eli Kintisch. One person in our email group responded most generously to my details, “You always amaze and invigorate me with your skill to lay open wide the truth.” From those two bits, Dr Legates’ reply afterward to me and the original email sender now has a fuller context for his opening sentence and subsequent reference to Science reporter Kintisch. Dr Legates gave me permission to use his email in verbatim form as a guest post here, but I added asterisks at one spot for a reason that becomes obvious at the end of this post. Please let me add my congratulations to the work you do. It often goes without saying but it should be said explicitly from time to time. So one night I happened to be in the office at 8:30PM. The phone rang and when I answered it, a stunned Eli asked if I was Dr. Legates. When I responded in the affirmative, he stumbled around that he had questions to ask me. “Fire away,” I told him. He then indicated he had not yet put together a list of questions for me and he did not answer my question as to why he had been calling now and over the last two weeks if he was unprepared. It was Tuesday night and I asked him for his deadline. “Friday afternoon,” was what he told me. I said that I would be out of the office on Wednesday but on Thursday he was to call back and I would answer his questions. I asked for his phone number and was given it. On Wednesday, he left messages for me both at home and at work thanking me for answering his call and saying that he was looking forward to our phone call on Thursday. So Thursday came…no telephone call. Finally, at about 6PM, I called him. He indicated that he still did not have questions for me and I told him I was puzzled in that his deadline was within 18 hours. He told me he would probably ask for an extension and would get back to me. He did ask some basic questions like “Who is your contact at Exxon-Mobil?” or “How much money do you receive each year for climate change denial?” On Sunday, I got another call from him on my work phone…he was on vacation in Israel and he gave me a number in Israel to call with answers to questions he apparently now had. I never returned the call. So he wrote the attached article in Science** where he attacks me for my work with the DOJ. I am convinced the only issue he wanted from me was to write that I had ducked numerous attempts to ask me questions. That is why he called me at home in the daytime and at work at night. You will notice in the article that he writes “The plaintiffs counter with a 45-page brief…” The plaintiffs never counter…it is the defense that counters the evidence presented by the plaintiffs which is what I did. He makes it look like I wrote a load of bunk that several scientists have had to come to the defendants aid to counter my lies. I asked the UD publication office how he got my picture and they told me he had contacted their office, told them that Science was writing a paper about me, and that I had given him permission to get my picture. They complied without inquiring further…after all, if Science is writing an article about you, that has got to be a good thing, right? This entry was posted in Character assassination, Guest Post by Russell Cook. Bookmark the permalink.